Technology has always been an enhancer of our work. From adding machines to the advanced computer this was always the case. Such extensive applications are broadly categorised as digital transformations. Today’s column explores the prospect of going digital while treating humans in a dignified manner. In the organisational context, going digital is closely associated with the term supply chain. The supply chain (SC) encompasses all activities associated with the flow and transformation of goods from the raw materials state to the end user as well as the associated information flows. Materials and information flow both up and down the supply chain. Supply Chain Management (SCM) is the integration of these activities, through improved supply chain relationships, to achieve a sustainable competitive advantage. Mentzer and others (2001) defined supply chain management (SCM) as the systematic, strategic, coordination of the traditional business functions and the tactics across these business functions within a particular company and across businesses within the supply chain, for the purpose of improving the long-term performance of the individual companies and the supply chain as a whole. In essence, the digital business transformation is the conversion of operations from the industrial age to the information age. 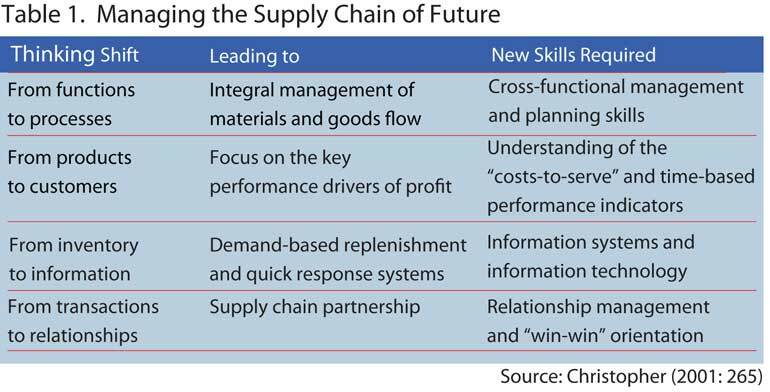 According to Mike Jonston, a researcher on supply chain, the model for creating business value has changed. Companies today participate in extended supply chains, where real operational efficiency and revenue enhancement come from greater visibility, integration and synchronisation among connected partners. 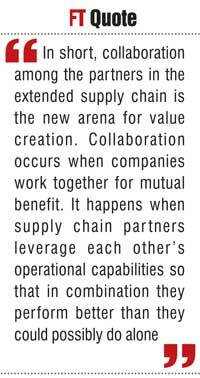 In short, collaboration among the partners in the extended supply chain is the new arena for value creation. Collaboration occurs when companies work together for mutual benefit. It happens when supply chain partners leverage each other’s operational capabilities so that in combination they perform better than they could possibly do alone. Collaboration can occur at all points along the supply chain—from design through procurement to final distribution. When done effectively, it enables companies to share information that can dramatically shorten processing time, eliminate value-depleting activities and improve quality, accuracy and asset productivity, all of which are fundamental to long-term success. For a firm to achieve true collaboration, it must go through what we call a digital business transformation (DBT). DBT is the journey of reinventing how daily business is conducted to fully exploit information technology and to facilitate supply chain collaboration to achieve unprecedented levels of operational excellence. It’s the process of reinventing a business to digitise operations and formulate extended supply chain relationships. The DBT leadership challenge is about re-energising businesses that may already be successful to capture the full potential of information technology across the total supply chain. In essence, DBT is the conversion of business operations from the Industrial Age to the Information Age technology. It’s about reinventing and positioning business operations, processes and relationships to fully exploit information technology. Six key aspects frame the challenge of digitally transforming business. Donald Bowerzox and others (2007) call these the six Fs of going digital. They speak to the mindset which leaders must adopt as they begin to reconfigure every aspect of their organisation to contribute economic value. Fact-based management is a commitment to, or even an obsession with, developing precise information on every facet of what the organisation does and needs to do. Fact-based management provides answers to questions such as: Why do we provide this service? What value does it add to customers? What are our precise performance expectations? How exactly do we meet and measure these expectations? Facts are not averages. Facts deal with specific performance results in items of specific customers. Managers must learn to understand and rapidly act on these results at the specific product level and customer purchase location. Driven by facts, successful firms demonstrate an inherent ability to rapidly adapt operations to pursue a new course of action. Confronted with a breakthrough opportunity, they are agile enough to make adjustments quickly and commit the resources necessary to capitalise on the opportunity. This has more relevance to the private sector. One of the key meaningful measures at the end of any day, week, month or year is the cash balance. As they make the digital transformation, companies must remember that cash pays bills. Cash pays salaries and wages and cash pays shareholder dividends. The focus must be cash first, cash second and cash always. A business needs to make contiguous investments in new products, services, technology, people and facilities. All investments are made with an expectation of financial return. The new mandate, however, is not just high rates of return fast. Payback periods need to be short and rapidly yield positive returns – which translates to cash. Fungible means that business processes are modular in design with maximum interchangeability. Modularity allows flexibility in process design and maximum incorporation of the principles of postponement and acceleration. The operational characteristics of agility, flexibility, sustainability, scale, scope and responsiveness are all attributes of fungible organisations. Capital investment, cash velocity and a flat organisational structure with focused human resources are characteristics of a frugal enterprise. Frugal enterprises are lean in every conceivable way. Overhead is minimal. Operations are focused on cash generation. Lean is an enterprise-wide attribute that must permeate every facet of every process. In frugal enterprises, the real benefits are cash dividends, not fringe benefits or luxurious environments. At the end of the day, employees work for income and owners invest for dividends. With business success, both constituents will benefit from the enterprise’s success. With the above six Fs taking place, the nature of the organisations will also change. Let’s look at the characteristics of the emerging organisation. Based on how successful a firm goes through a digital transformation, its scope and shape will substantially change. Christoper (2001) in his writings on the future of supply chain attempts to describe the change as a series of thinking shifts. Table 1 contains the details. According to the above table, there is a clear need for an integrated thinking shift, resulting in another shift in implementation focus. Future managers need to gain the above mentioned skills in order to confidently carry out the challenging tasks ahead of them. As Donald Bowersox observe, the greatest barriers to a digital transformation are not technical or legal. Rather, they relate to prevailing managerial and employee attitudes, practices, and traditions around what constitutes best practice. Most acknowledged best practices were established decades ago using the technology then available to address problems or challenges that for the most part no longer exist. Actions that once were considered best practices are increasingly becoming unnecessary or obsolete. Yet it’s the perpetuation of these traditional practices that thwart significant breakthroughs toward new and more meaningful ways to work. Digital business transformation is about significant change. It should be diligently driven by leadership. It is the ultimate challenge in change management because it impacts all organisational levels of an enterprise and its extended supply chain. The transformation starts with redefining the firm’s strategic vision—that is, the shared composite of goals, competencies and capabilities a firm deploys to create and sustain its competitive advantage. At this early stage of the digital transformation, it’s clear that some organisations are having a tougher time getting started on the journey than others. For example it’s evident that A&P, Corning, Kodak, Motorola, Sears, and Xerox, to name a few, waited far too long to adapt to the digital imperative in both products and processes. Others, such as GM, Procter & Gamble, and IBM seem to be well on their way. In any case, one thing is clear: The digital business transformation is best initiated from a position of strength rather than weakness. As Mike Jonston points out, additional considerations in the seamless execution of DBT involve transitioning from traditional ideas about organisational structure. The traditional line-and-command, functionally focused organisational chart is replaced by an integrated supply chain structure built on these three shared values. We have come a long way in realising the need to be diligent in going digital. Technology is not panacea for all illnesses. Also, its effectiveness vastly depends on the users. People with right attitudes and aptitudes will reach greater altitudes in leveraging their digital business transformation.